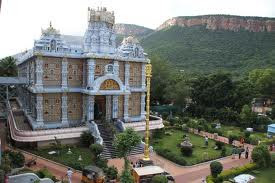 There are many other places in the temple town Tirupati that are worth visiting. Tirupati has another recently built landmark The Hare Krishna Lotus temple. The temple is located on Hare Krishna road, Vinayaka nagar near Alipiri. This Lotus temple was built by the ISKCON (International Society of Krishna Conscience). The Deities here are Radha Govinda.The temple is lavishly built with about three storey building and imposing structure resembling both northern and southern Indian style of architecture. The temple appears as placed on a lotus petal. The temple has a beautiful small garden. Every part of the temple is beautifully decorated and nicely carved. The ISKCON temple at Tirupati is said to be the largest ISKCON temple in India. The main entrance is marked by a huge wooden door finely carved with some amazing work of motifs. The main temple on the third floor is a huge grandeur hall with sculpted pillars and with images of Radha Govind (Lord Krishna and his consort Radha) and Ashta Sakhis installed on a raised platform. Just on the left side of it you can see the seat of Guruji A.C. Bhaktivedanta Swami Prabhupada (founder of ISKCON). The staircase in one corner leads you to the second floor has an auditorium and an audio visual studio. The first floor that has an exhibition hall, dioramas of Lord s various incarnations and several mythological episodes. There is a good guest house next to the temple that has very nice, clean rooms for the members of the ISKCON society. It is best to book a room in advance. There is also a restaurant where you get simple "Satvik" food. 4.30 pm to 8.30 pm. The ISKCON - Hare Krishna Lotus Temple is located at Hare Krishan Road,Vinayaka Nagar near Alipiri. You can get here by local taxi or auto-ricshaw.